I very rarely trip when trail running. I might stumble a bit when I get tired, but I am usually very careful and able to remain upright. Last week I was messaging my coach talking about how next year I’d like to focus on speed instead of increasing distance, perhaps doing an off road triathlon and then doing a hundred miler in 2020. But DH is worried about me busting my head open if I try mountain biking. I think I jinxed myself. 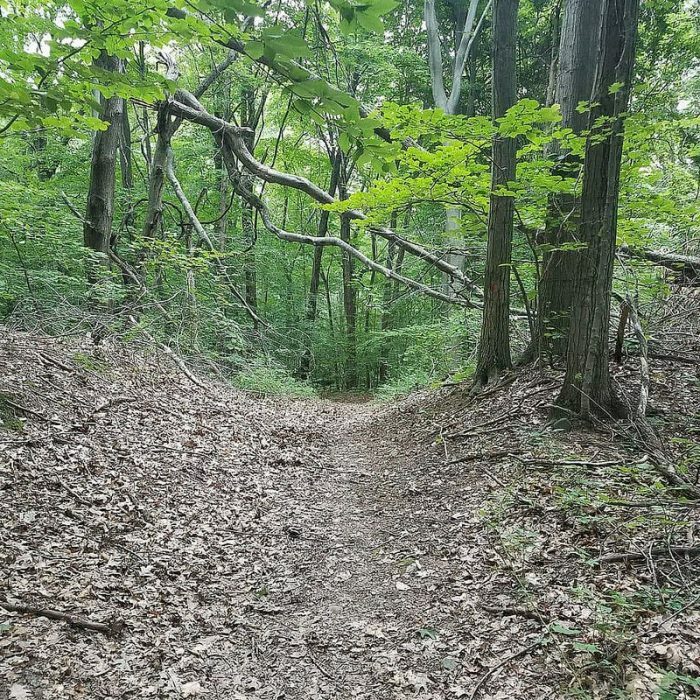 After taking a couple of days off because of post-travel digestive issues, DH and I went out for our usual Thursday evening trail run at the Ravines. My legs felt so fresh, and even with running up the hill my heart rate was not even at zone 2. I felt like I was flying. The training is working! DH was surprised that I was pushing him with minimal effort. I was admiring my low heart rate and minutes per mile when . . . BAM! 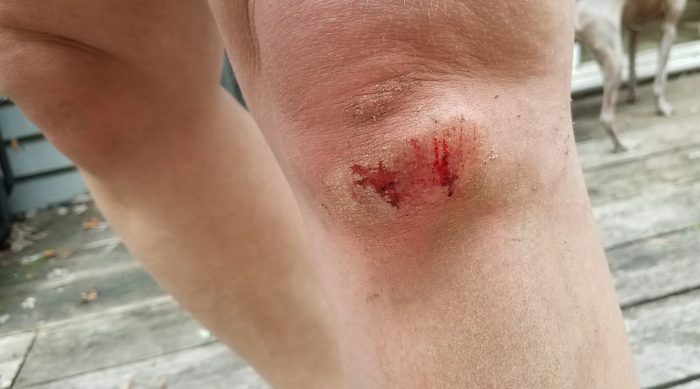 My knee hit the ground, which is clay and hard as concrete. Shocked, I got back up and started running again to feel it out. My knee had an awful scrape and I had a pain that I was trying to run through while figuring out where it was. When the pain didn’t shake off but instead got worse, I decided to call it a day. I hobbled to the nearest road while DH ran back to get the truck. I tried not to panic, dreams of my first 100K going up in flames. I guess that’s what I get for being over confident. Turns out I strained my hip flexor. I have an appointment with a PT today to get advice on whether or not I should run or walk any time soon. My coach says that I have enough base mileage in that even if I have to take some time off, I should be able to complete the 100K in a month, although it might not be a strong finish. In the meantime, I am looking ahead and trying to figure out my race schedule for next year. It helps keep my mind off the injury. It is really strange not being able to train. Over the weekend DH and I binge watched the latest season of Orange is the New Black. Last night we went out for sushi. But what I really want to do is run, especially since I’m seeing progress. How do you get your mind off things when you are injured? Let me know in the comments! 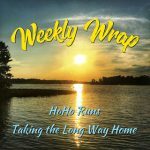 For more fitness inspiration be sure to check out these running link ups: The Weekly Wrap hosted by hosted by HoHo Runs and Wendy from Taking the Long Way Home and Tuesdays on the Run with Patty, Erika, and Marcia! Ouch! I have some pretty rough trails I run on and I love it for the peace and quiet but I really got to pay attention because there are a lot of obstacles. Ouch! I’m so sorry to hear about the fall. As if the scrape isn’t enough–the hip flexor strain had to happen too. Boo. I hope you heal up quickly. When I’m injured, I try to find other things that I can do. Can you cycle? I really need to start cycling, but luckily I didn’t need to. It just needed some rest and is as good as new this week. Oh Wendy I’m bummed for you. Crazy how things like that seem to come out of nowhere. Wishing you a speedy and full recovery. Like Wendy above, I immediately look for other things I CAN do. Ouch! A hip flexor strain sounds painful. I hope you recover quickly. I read a lot when my activity is limited. Oh no…OUCH!!!!! Hip flexor pain/strain is nasty. I hope things heal up quickly for you. I’m so sorry this happened! I’ve fallen while running and scraped myself up pretty bad. Once I ended up breaking my finger, but luckily that didn’t impact my running. I hope you heal quickly! I’m so sorry to hear about your fall. I hope you got good news at the PT or at least a plan of action for your recovery…I feel like that always help. I usually substitute cycling or pool running when I’m injured but with a hip flexor strain these may not be allowed either. Fingers crossed for speedy healing. Hang in there! I had an awesome meeting with the PT! Thank you so much. I’m so sorry to hear about your injury and that knee – I hope you’re feeling better! I’m currently injured with plantar fasciitis and working with a PT, hoping that I’ll be able to run again soon. I hope you recovery quickly! I hope you heal quickly and are still able to complete your 100k. Like everyone else, when I’m injured I switch my focus on a variety of group fitness classes and cycling. However, during my last marathon training cycle, my hip flexor become aggravated (not strained though) and I replaced one of my runs with pool running. Let me tell you …that was the magic ticket for me! It was relaxing, easy on the hip and strengthened it as well. Ask you PT if it is allowed! that is a horrible though, falling on a snake! I have seen several this year and I scream every time lol. Best luck with your 25K trail race!